This tiny, high speed, coreless motor runs on 3.7V and can spin up to 66000 RPM. The shaft is 0.7mm diameter and 4mm long. 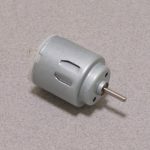 The entire motor including the bearing sleeve is 14mm long and 4mm across. SKU: ROB-064. Category: DC Motors. Tags: DC Motor, Light Packet, Robotics.